TNT Vocal Executor is iLok protected. The hardware key is not necessary, only the License Manager. Please refer to the guide to see how to activate the trial and full versions. TNT Voice Executor is a unique plug-in that offers quick and intuitive voice tracks editing. Despite the easy look, there are multiple effect modules inside the tool. 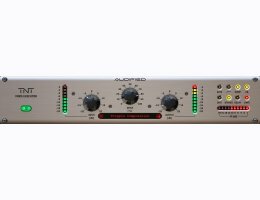 The plug-in contains complete dynamics controls and EQ, drive and delay. The modules settings are pre-set by TNT Studios. The effect is controlled by three knobs only. After loading the preset you only set up the input and output volumes and the effect amount. The owner of the TNT Recording and Postproduction Studios, Tomas Trkal, is a mixing engineer and a programmer in one person: "In some situations and jobs, you have to mix vocals or spoken word very quickly. Typically it is in broadcast operation or video production. We couldn't find find any plug-in that would suit this purpose well. So I had to create it myself..."
You may download a 30 day trial demo from the Audified website, HERE!